Hey there folks, we might be in the dead of winter, but things at the FPP are hopping! Leslie Lazenby and Mark O’Brien join Michael Raso in the studio today to discuss Cameras for the Ladies, the Olympus OM line of SLRs, the Bilora Boy Camera, Konica Auto S2, the Center for Creative Photography at the University of Arizona, and so much more! 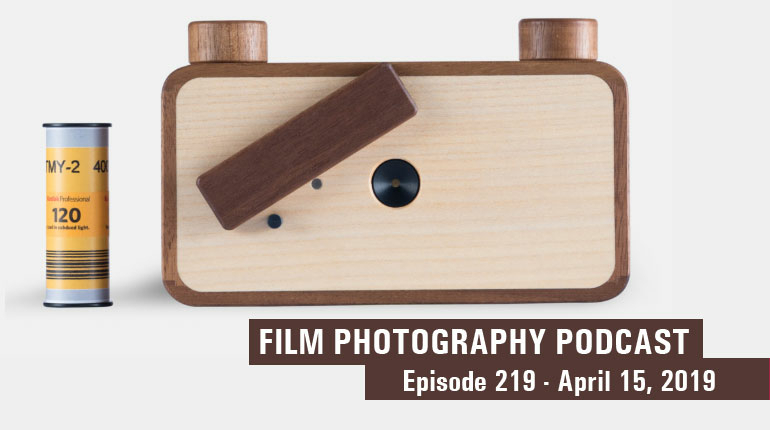 So don’t touch that dial and settle in for the Internet Radio Show that’s all about Film Photography! If there’s one thing we can count on Leslie to bring to the table, it’s the rare and obscure when it comes to cameras. And today’s camera is no different, this is a cute little box camera that kind of looks like a tombstone. The camera itself is made by Bilora, and is the first version of the Boy. First released in 1949, the camera takes 127 roll film and shoots a 4x6.5cm image. The lens is a simple single element f/11 fixed focus and a 1/30" shutter speed, plus blub. The camera itself is made of Bakalite. It's a pretty simple camera - you don’t have to think, just point and shoot. But why the name Boy? Finding out required quite a bit of research, including a call to her friend Owen. And the answer proved very simple - the camera was aimed at the Western market and specifically for boys. To make it all the more interesting, Leslie tested the camera at a local fair in conditions she thought very similar to its original use. The results speak for themselves, the photos have a distinct mid-century vibe. Moving from the Boy to the Girl, Leslie speaks to a shift in the photography market, that of making cameras attractive to women. A huge untapped market, the trend starts as early as the 1920s with Kodak's Vanity series of cameras based on the Vest Pocket camera line. The main difference in the cameras market to women is colour - instead of the basic black they came in a variety of colours and feature model names based on the names of birds. Also notable is that they came in a beautiful display case that included a lipstick case, mirror, powder,, and blush. Along the same lines as the Vanity is the Kodak Petite, which is again based on the Vest Pocket, but now comes in a lovely blue, brown and gold patterned cover and matching case. And like all Vest Pocket cameras both the Vanity and Petite used 127 film. Kodak wasn’t the only one to start marketing cameras towards Women, in the 1960s Argus got onboard with their Lady Carefree model. First released in 1967, the cameras were not actually made by Argus but rather by two companies, Balda-Werke in Germany and Sedic in Japan, and featured softer colours and patterns. The Lady Carefree took 126 film and had a flash cube mount. The Sedic version was also sold as the Argus Instant Load 146X or Astral S20, which was the first camera sold in Japan to use an Electric Eye and Magicube. But don’t try to use a reload or the Fakmatic on the Carefree, it just doesn’t fit! Moving up to the 1980s, Minolta jumped onboard with their Courrèges, designed in conjunction with the French Fashion house André Courrèges. Minolta released two versions, the first based on the Disc-5 and the second on the Disc-7 ( and yes this is a slim DISC film camera. The camera itself is covered in the logo of the fashion house and in a lovely cream-white with gold accents. Another model came in a pinker motif. The camera never made it to North America, but only was released in France. 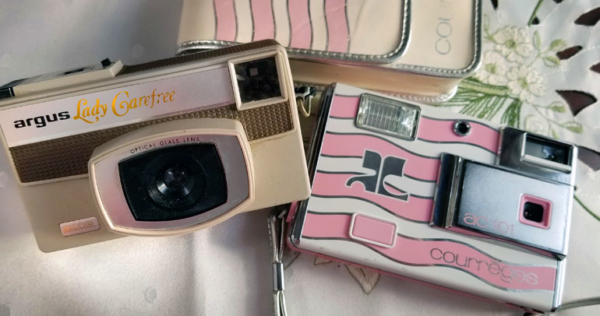 And of course, the trend of marketing cameras to girls continues with the Pink Polaroid Barbie Type-600 and Spice Girl Cameras. And while Leslie has little use for these cameras, they are a fun addition to a collection. If you’re a long time listener of the FPP, you’ll know that Leslie has a thing for Olympus cameras, and specifically Olympus' cult line of SLRs. It all started with what Leslie considers the flagship of the modern Olympus SLRs, the OM-1, discussed back on episode 166. The camera changed the photo industry, and while it wasn’t the first system camera, it was the first system camera in a smaller format, for both the professional and the amateur photographer (it didn't hurt that Leslie got a great discount on the purchase because she worked for an Olympus dealer who realized that employees would better sell the products they actually used). After the OM-1, Leslie bought the Olympus OM-2 - and used both in her professional career as a photographer, to shoot weddings and for duplication work. And the reason for the general ease of use is that the exposure controls, focus, aperture, and shutter speed are all arranged logically across the front of the camera, with the shutter speed control being a part of the lens mount - meaning you don’t have to take your eye out of the viewfinder. Oh, and the depth of field preview is also on the lens! The biggest difference between the OM-1 and OM-2 was all in the automation, while the OM-1 is a full manual match-needle camera, the OM-2 has semi-automatic exposure control (Aperture Priority). Additionally there were some variants, the MD badge indicated the cameras could accept a motor drive and there were also the OM-1n and OM-2n which had some cosmetic and operational changes. Plus everything is interchangeable from lenses to accessories (except for some hot shoes). Plus, the cameras are remarkably sturdy and can stand up to the thousands of rolls that she’s put through the camera. Leslie recently took her OM-2 back off the shelf when she bought a new 50mm lens, a Zuiko 50mm f/1.4 and started testing some new film for the FPP. And to ensure a constant test bed, Leslie stuck to what she knew, and fixed up a three lens kit (28, 50, 70-150) and all mounted on the OM-2 (and when it comes to Zuiko lenses there are no bad lenses - everything is super sharp). The OM-2 had full TTL metering and could keep the shutter open a full 2 minutes on Aperture Priority mode, opposed to the standard 15-30” on other cameras. But the OM-2 didn’t stop there, even with the release of the OM-3 and OM-4 in 1986, Olympus reissued another variant of the OM-2, the OM-2S or OM-2SP. The upgrade included full program mode Auto Exposure, a fixed hot shoe, LCD screens, and a spot meter option. The viewfinder is 97% coverage and is super bright, also with interchangeable focusing screens something making the camera infinitely more customizable. And the display changes depending on your camera mode. And as for battery power, you can use standard LR44 in both Alkaline and Silver Oxide, but Leslie recommends Silver Oxide as they last longer in the OM-2. And if you don’t want to just take Leslie’s word on the OM-2, Professor Jeff used the camera system when the light was tricky, and Professor Jeff shot both Mamiya RBs and Hasselblads. Today the cameras can pick up a price tag of 100-150$ on the used market, but are certainly worth the money. And that about covers it for this show, but don’t worry, we’ll be back sooner than you know! But until then be sure to check out the FPP on-line store for the fuel for your cameras, and our Flickr group to interact with the community. Sign up for our Newsletter at the homepage to catch the latest and greatest news and give us a like on the FPP Facebook! Need to contact us, email us at podcast@filmphotographyproject.com or send us a letter, Film Photography Podcast PO Box 264, Fair Lawn, NJ, 07410.